Frank Sinatra played the role of kingmaker for aspiring hitmakers. In April 1940, the Tommy Dorsey Orchestra and Sinatra turned “Polka Dots and Moonbeams,” by Jimmy Van Heusen (music) and Johnny Burke (lyrics), into a top-20 hit. That summer, Dorsey and Sinatra topped the charts with Ruth Lowe’s “I’ll Never Smile Again,” and Lowe repaid her gratitude by sending Sinatra “Put Your Dreams Away (For Another Day).” It became his signature tune. In 1941, Dorsey and Sinatra turned Joe Bushkin and John DeVries’ “Oh! Look at Me Now” into one of the band’s most popular tunes, and Sinatra was just getting started. There is, of course, a world of difference between cellist Yo-Yo Ma and Sinatra. Like Sinatra, though, Ma occupies one of the top-two spots of his craft. (Sinatra had the misfortune of plying the same trade as Ella Fitzgerald. Ma sets the contemporary standard on cello.) When I learned that Ma had returned for a third time to the Bach cellos suites with Six Evolutions (Sony Classical), I thought, okay, fine, but what a waste of his star power. Like Sinatra, Ma could jumpstart the careers of “classical” composers by getting a combo together to bang out an album of original tunes. Not this time. For Ma, his recordings of the cello suites in 1983 (age 28), and again in 1998, did not suffice. These are difficult times for popular music, nearly impossible times for classical music, and still the cello suites maintain their allure, 300 years after Bach put quill to paper, and 80 years after cellist Pablo Casals produced their first recording. To explain his return to the suites, Yo-Yo Ma plays the role of statesman, say, rather than chairman–Sinatra’s most durable nickname. (Note: Sinatra revisited his own tunes, too, returning in 1956 to “Close to You” (first done in 1943) to try to patch things up with Ava Gardner.) For decades, the cello suites have provided Ma with sustenance through celebration and loss. Still, Ma asks anew, “What power does this music possess that even today, after three hundred years, it continues to help us navigate through troubled times?” Like Casals, Ma offers his latest and final take on the cello suites as art for life’s sake. Today, Ma’s an international musical diplomat, and he’s a smart guy, a devotee to Casals, and he knows madness when he sees it. Ever the pragmatist, he resists casual use of the “f” word to describe the nationalist revivals in the US, Brazil, Italy, and Germany. “Culture helps turn ‘them’ into ‘us,’” Ma says, “and these things have never been more important.” These things, I suppose, include representative democracies, liberal humanism, the Western tradition, multicultural affinities, and good wine. Definitely wine. As Ma embarks upon a two-year, six-continent celebration of the cello suites, he worries not about virtue signalers, or about accusations of cultural colonialism, cultural appropriation, or both. At 60, Ma senses how time itself has changed, for himself as a human and musician. Time is “at once expanded and compressed,” Ma imagines, and every American captive to the merciless cadence of the contemporary news cycle agrees wholeheartedly. Attentive listening to Six Evolutions on compact disc or vinyl (yes! ), alone or with a friend, for one suite or all six, may be the most compassionate and scientifically sound mode of self-care available. Don’t be surprised if the CD appears on the shelves of your local pharmacy. 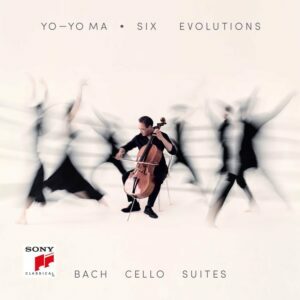 With Six Evolutions, then, you’ve got the world’s best cellist, with the weight of the world on his bow, playing the most celestial compositions for solo cello ever assembled. It is absolutely stunning. Compare, for example, the allemande movements of suites one and two, from the 1998 recording (remastered in 2010) and Six Evolutions. On Evolutions, Ma sounds as if he’s playing a different, more percussive instrument, and with more precision in terms of meter. In places, Ma accelerates the bow in the middle of the note, which increases the dynamic range of each note and phrase. (On the scores, Bach offered little to no interpretive guidance.) Ma’s approach also produces more silences between the notes–akin to dance steps, rather than singing, and this interpretation honors the primary influence on Bach during the second decade of the 18th century: dance music. If you own a previous recording of the suites by Ma (or Sergei Istomin or Zuill Bailey), you’re fine. If not, it’s time. It’s Yo-Yo Ma, for Bach’s sake. And for our sake, too.